2) Place the salmon portions on a baking sheet and sprinkle with olive oil. Bake for 10-12 minutes until done. 3) Remove from the oven and let the fish rest for 2 minutes. 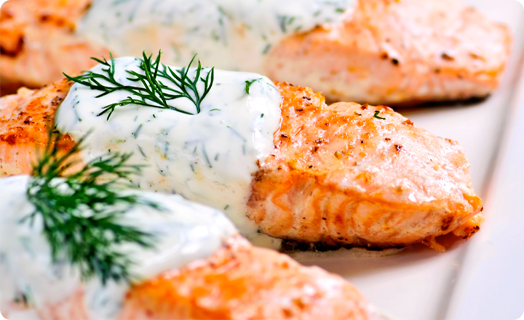 4) Spoon our Santa Monica Seafood Dill Sauce on top and garnish with a sprig of dill.